Mundoora is a settlement in South Australia, 16 km inland from Port Broughton, to which it was connected by a horse-drawn railway around 1876. Its tram, dubbed "The Pie Cart", which was described as a "kind of second-hand coffin drawn by one horse" and still in operation in 1923 was later relegated to the Railways Museum and the line dismantled. At the 2006 census, Mundoora had a population of 248. The first local government established in the area was the District Council of Broughton, later called District Council of Redhill. Mundoora was never served by the historic District Council of Mundoora, which was instead based at Port Broughton, 15 km (9.3 mi) to the west. Today the township of Mundoora is in the District Council of Barunga West but the locality is at the meeting point of three local government areas, the Port Pirie Regional Council spanning the north east and Wakefield Regional Council spanning the south east corners of the locality. 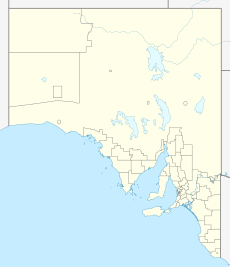 Mundoora is in the state electorate of Narungga and the federal electorate of Grey. ^ a b Australian Bureau of Statistics (25 October 2007). "Mundoora (State Suburb)". 2006 Census QuickStats. Retrieved 11 October 2011. ^ a b "Postcode for Mundoora, South Australia". postcodes-australia.com. Retrieved 10 July 2016. ^ a b c d e "Search result for "Mundoora (Locality Bounded)" (Record no. SA0067679) with the following layers selected - "Suburbs and Localities", "Local Government Areas" and " Place names (gazetteer)"". Property Location Browser. Government of South Australia. Retrieved 10 July 2016. ^ "Monthly climate statistics: Summary statistics SNOWTOWN (RAYVILLE PARK) (nearest station)". Commonwealth of Australia , Bureau of Meteorology. Retrieved 10 July 2016. ^ "2905.0 – Statistical Geography: Volume 2 -- Census Geographic Areas, Australia, 2006". Australian Bureau of Statistics. Retrieved 8 December 2009. ^ "Farmers and Producers' Political Union". The Register. Adelaide: National Library of Australia. 17 July 1908. p. 8. Retrieved 11 April 2014. ^ "Ancient and Modern". The Mail. Adelaide: National Library of Australia. 21 July 1923. p. 6. Retrieved 11 April 2014. This reference has a photo of the "Pie Cart". ^ "Port Broughton Pictures". The Chronicle. Adelaide: National Library of Australia. 1 February 1951. p. 33. Retrieved 11 April 2014. This page was last edited on 3 March 2018, at 03:54 (UTC).